With the internet as a resource for cartoons, there are several databases in the U.S. and other countries documenting and providing free public access to collections that focus on public affairs and administration and describe the public service environment (see included Hine’s cartoon on child labor.) Databases include the Library of Congress, the National Archives, presidential libraries and museums, such as the John F. Kennedy and Harry Truman, and universities, including Ohio State and the University of Kent, UK. Many of the cartoons convey historical and topical information, reflecting the public discourse while also influencing audiences’ perception of the public sector. According to Deborah Leff, Director of the John F. Kennedy Presidential Library and Museum (2004), in his address to members of The Association of American Editorial Cartoonists (1963), President John F. Kennedy commended them for entertaining and instructing us with their ability to capture a story and a message in one picture, and to do so with impact, conviction, humor and passion, all of which he thought made them the most exceptional commentators on the American scene at that time. Indeed, cartoonist have long been recognized for their contributions to educational processes and to raising public awareness. A hundred years ago (September 1918), the U.S. government established the Bureau of Cartoons as part of their World War I initiative, under the leadership of the Committee of Public Information (CPI). The purpose of the bureau was to involve American cartoonists in the presentation and dissemination of government information in ways that would capture public attention while providing opportunities for entertainment and laughter. The overall aim of the CPI was to garner support for the war effort. 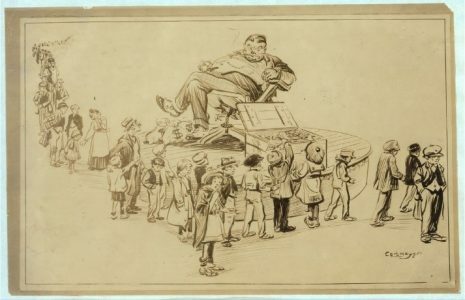 This included the bureau’s provision of a bulletin for cartoonists, which contained inspirational ideas and messages, as noted by the Center for Media and Learning, CUNY. On the subject of public affairs and administration, cartoons have historically been used to highlight current events and communicate opinions about public officials and public service professionals. Public servants have continuously been the target of editorial cartoons. It can be said that this treatment comes with the occupation, beginning as soon as a public official is elected or appointed. More often than not, however, the field has been negatively portrayed. Although such caricature, humor and satirical representations may be useful in fostering worthwhile self-analysis, they should not ultimately define the culture of public service organizations and their professionals. Human resources specialist emphasize the important role of organizational cultures in effective management. For example, negatively construed perception of public sector organizational culture can deter excellent candidates from joining the public service, while demotivating current employees. Unfortunately, a cursory search on the Internet yields a large quantity of cartoons that critique public servants. Some common themes are inefficiency and corruption. The vast majority of public service professionals, however, work earnestly and are highly motivated by their dedication to serving the public interest. More in-depth research is necessary to reveal cartoon portrayals of public affairs and administration that are positive and inspirational, like the research of Mordecai Lee, Marc Holzer and Tony Carrizales, who have made important contributions to building favorable concepts of organizational culture and professionalism in the delivery of public goods and services, and to promoting public trust in government agencies. Like other types of cultural awareness and appreciation, the establishment of positive perception of public organizational culture should be an on-going process, developing over time, with attention to counteracting the production of negative images that currently prevails. 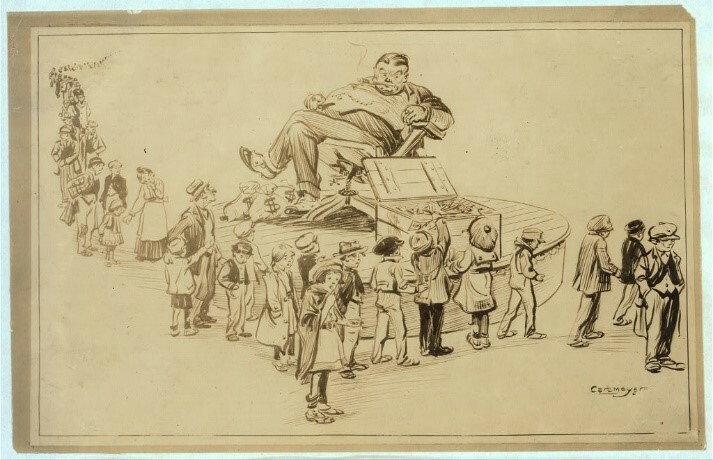 The purpose-led strategy of the CPI a century ago, and President Kennedy’s acknowledgement of the scope and impact of cartoonists as partners in public information and education encourage us to consider contemporary cartoonists in such roles. Those of us involved with developing human resources for the field could put positive portrayals of the public sector to good use in class. Usage could be for discussions about symbolism, to illustrate related historical events and their time-lines, to clarify concepts of efficiency and ethics, and to demonstrate the calling to public service. Other fields are documenting their use of cartoons in course delivery. Faculty in economics, linguistics, psychology and political science are using cartoons to promote students’ thinking abilities and analytical skills, as stated by Juanita Villaveces Nino and Paul Rodriguez Lesmes (2009) in their article about cartoons as a primary source for the study of economic history in Colombia. Taher Bahrani and Ramatollah Soltani also highlight the pedagogical value of cartoons for language learners, in that they require (2011) less cognitive processing for comprehension, while including new aspects of language. An encouraging factor is the conversion of cartoons to digital format, making them accessible and supporting further research and use by faculty. Worthy of note is the provision of guidelines by the Library of Congress, for studying and analyzing cartoons. Much of the available pedagogical material, however, is prepared for use at primary and secondary levels of education. More developmental input is necessary to facilitate incorporating them in tertiary education.